Dried plums are a good source of iron and potassium. Every cell in your body relies on potassium and iron to keep it working normally. Without enough iron, your cells wouldn’t have the oxygen they need. 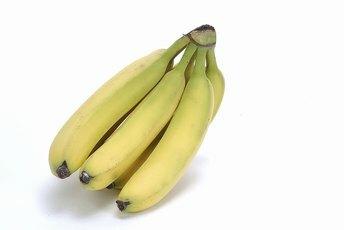 Without enough potassium, the fluids in and around your cells would be dangerously imbalanced. Iron supports immune system health, potassium helps maintain normal blood pressure and both minerals contribute in different ways to muscle contraction. Potassium and iron occur naturally in a wide range of foods, but fewer foods contain considerable amounts of both. White-flesh potatoes, such as russets, are high in potassium and iron, as long as you eat the skin, too. According to the U.S. Department of Agriculture, a medium-sized baked potato with skin provides about 160 calories and more than 26 percent and 10 percent of the daily values for potassium and iron, respectively. For about another 100 calories, a large baked potato with skin supplies upward of 46 percent and 18 percent of the daily values for potassium and iron, respectively. Unlike white potatoes, sweet potatoes carry a higher percentage of their nutrients in their flesh. They’re also relatively low in calories -- a large sweet potato with skin has about 160 calories, or the same amount as a medium-sized potato. It also provides 24 percent and 7 percent of the daily values for potassium and iron, respectively. Sweet potatoes are also an excellent source of vitamin C, a nutrient that helps your body absorb nonheme iron, the type found in sweet potatoes and other foods of plant origin. 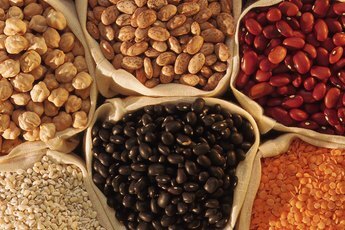 Mature legumes, or dried beans, peas and lentils, are sources of many important vitamins and minerals, including potassium and iron. Adzuki beans are especially rich in potassium and iron -- for just under 150 calories, a 1/2-cup serving supplies 17 percent and 13 percent of the daily values for potassium and iron, respectively. By comparison, lentils have about 25 percent fewer calories, are lower in potassium and higher in iron. For about 115 calories, a 1/2-cup serving of lentils provides 10 percent and 18 percent of the daily values for potassium and iron, respectively. Dried plums, or prunes, are a more concentrated source of calories and nutrients than fresh plums, providing just over 200 calories and about 18 percent and 5 percent of the daily values for potassium and iron, respectively, per 1/2-cup serving of pitted fruits. The same size serving of seedless raisins provides the same amount of potassium and about twice as much iron, according to USDA data. Raisins are also about 20 percent higher in calories than dried plums, however, with nearly 250 calories per packed 1/2-cup serving. Low in calories and rich in an array of vitamins, minerals and phytonutrients, spinach ranks as one of the most nutritious foods available. For just 41 calories, 1 cup of cooked spinach delivers 24 percent and 36 percent of the daily values for potassium and iron, respectively. Because cooked spinach is more concentrated by volume, you’d have to eat about 5 cups of raw spinach to get the same amount of potassium, and 8 cups to get the same amount of iron. Meat, poultry, fish, nuts, seeds and many other foods also contain both potassium and iron. In general, foods that tend to be high in iron tend to provide a lesser amount of potassium, and vice versa. For example, half of a Florida avocado supplies 15 percent of the daily value for potassium, but just 1 percent of the daily value for iron. A 3-ounce beef patty made from 95 percent lean beef provides 8 percent and 13 percent of the daily values for potassium and iron, respectively. Leaner cuts of meat are usually higher in potassium. Are Collard Greens or Kale More Nutritious? Are Turnips a Starchy Vegetable? Is Spinach High in Fiber? Do Avocados Have Lots of Iron in Them? Which Vegetable Has the Most Phosphorus?